Before I get started on this year's trip, I want to share one of my favorite destinations from my travels so far. I visited Pompeii last summer at the end of my last Europe trip. While I went to a lot of awesome places during that trip, nowhere stood out as much as my visit to Pompeii. Why? I'm not sure, but I absolutely loved it. The town itself is a typical small Italian town, and they rely heavily on tourism from day-visitors. The remarkable part was that it seemed none of these visitors ever spent the night! This meant that after about 5pm every day, the town was deserted. It was mid-summer, and I felt like one of the only tourists there. I did a lot of things backwards or wrong, but I still had an amazing time. I left Rome around 6pm on a train to Naples which took just over an hour. It was a comfortable ride, and after getting off the train, I followed the signs to the Circumvesuviana Trains, which connect Naples with the surrounding area (including Pompeii, Sorrento, Sarno, and countless other towns). These trains are privately-owned and therefore a rail pass does not work for them. Tickets are cheap though, so it's not a major inconvenience (beyond knowing to buy tickets!). I caught one of the last trains of the day from Napoli Centrale to Pompeii, and it was pretty obvious I had ventured into Southern Italy: People were smoking all over the train platform, the train cars were covered in graffiti, and although the train cars are supposedly new, their insides looked like something from the 1950s. In the car I rode in, the station announcement system was broken, and it seemed each station had their signs covered in graffiti. Since it was nighttime, the combination of graffiti and darkness made it even harder to identify where I was. I tried asking a couple people, but they were no help. I tried counting the stops relying on the route map, but that was no help either, because I was tired and lost track of the stops. After a while, I started to think I had missed my stop, but I decided to keep going. Sure enough, one stop later was Pompeii Scavi. Great, right? ... Well, not so much. I didn't see the sign until after the train doors had closed, because it was all the way on the far end of the station. I got off at the next stop, planning to take the next train back one stop. Great plan, right? Nope! That was the last blue-line train of the day, and there was not another soul in sight. The train station was deserted, and I appeared to be in the middle of nowhere. I called my hotel in Pompeii and explained what happened. After a few minutes, I managed to figure out where I was, and the hotel sent a taxi to pick me up. After the rocky start, I was very glad to get to my hotel and sleep. I stayed at Hotel del Sole, and it was quite nice. The staff's English wasn't great, but they were very friendly, the rooms were clean and comfortable, and they offered a nice breakfast in the morning. The best part was that I could see the ruins from my bed, framed in the background by Mt. Vesuvius. The view probably wasn't unique to my hotel, but it was probably one of the best in the city, given the hotel's location directly across the street from the ruins. After a hard-earned night of sleep, I spent my first day exploring the ruins of Pompeii. While the hotel was located directly across the street from one of the entrances to the Pompeii ruins, this entrance was not the main one. As I later discovered, it was not an ideal starting point to explore the ruins since I was working backwards. I highly recommend starting at the official entrance across from the Pompeii Scavi station, since audio-guides can only be found there (and they must be returned there too! ), and there are guided tours available as well. The lines are longer, but there are more resources available than at the smaller entrance. Also, once you enter the site, you cannot leave without buying another ticket. There is a cafe inside the site, but it is pretty overpriced, so I'd recommend bringing something for lunch. Of course I did none of these things, and armed with my 1.5L bottle of water, backpack, and camera, I entered through the back entrance, bought a ticket without realizing I couldn't leave again, and forgot to bring anything for lunch. There is very little shade available, so bring sunscreen, hats, and whatever else you might use to avoid sunburn. I wouldn't know, since I was burnt to a crisp. Oh, and make absolutely sure you bring a large water bottle... There are water fountains scattered across the ruins, and although they look kind-of disgusting, the water is cold and safe. They are a godsend, especially in the sweltering summer heat. My personal favorite was the brothel house. Sure, the wall paintings are pretty cool, and it's an interesting building, but the real fun begins when a tour group enters. The brothel is a very popular stop for all the tour groups, and listening to each tour guide try to explain the brothel, its art, and the walls covered in ancient graffiti, was better than a Comedy Central special, especially when there were kids on the tour. The awkward censoring, parents trying to shoo their children away, and shocked old women only made the experience better. It never got old, but after about 20 minutes I felt a little weird just hanging out in the brothel house, so I moved on. I didn't move on before taking a couple selfies though! Now, onto the reason why I feel it is so vital to spend the night in Pompeii: After about 5pm, all the tour groups go home, leaving the city deserted. Most of the popular buildings that all the tour groups visit are empty, and the evening breeze feels great after a day of sweltering 95-degree heat. Take advantage of the emptiness and visit some of the more popular sites in the evening -- You'll have a lot more space to enjoy them, and they're far more authentic when not crowded with fanny-pack-toting cruise-ship tour groups. It's difficult to convey just how different the atmosphere at an ancient site can be when you have it to yourself, but it really is an amazing feeling. 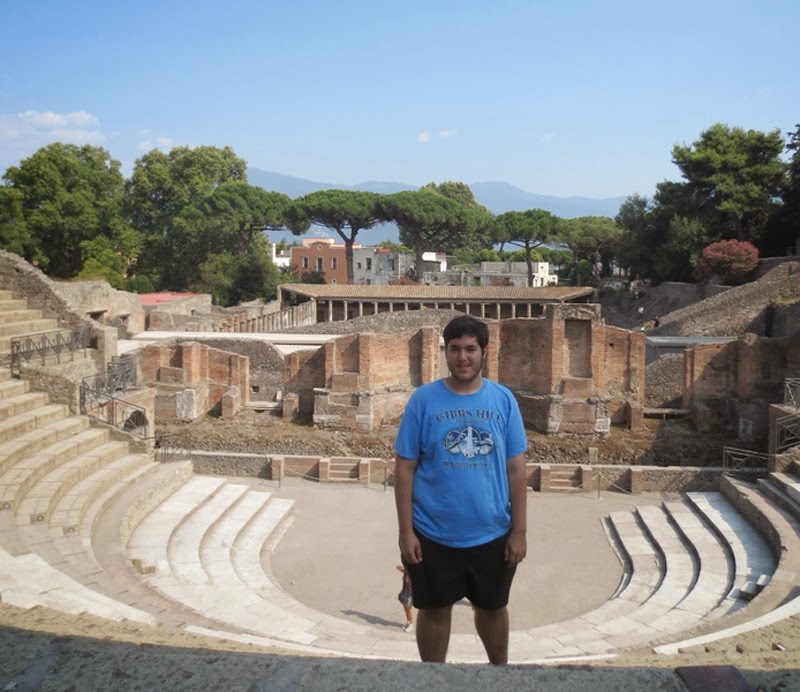 At the Pompeii Amphitheater -- Ah, the wonders of self-timer! The Archaeological site closes at 7:30pm, and when I got kicked out, having spent nearly 10 hours exploring the ruins, I was absolutely exhausted. I grabbed dinner at a pleasant local cafe, wandered around the town square a bit, and went to bed. Yes, I was more sun-burnt than an albino in a tanning salon. For my second day, I planned to hike up to the crater of Mt. Vesuvius. It can be done on a tour, but there are also buses that operate from near Pompeii Scavi station which bring you to the highest point that vehicles can go. I arrived at Pompeii Scavi and bought tickets with Bus Vesuvius. After buying tickets, I boarded the bus that takes you to meet the 4x4 bus that takes you to the highest point. Yes, a 4x4 bus. The roads are in horrendous condition, and there are some potholes that are several feet deep. In fact, lucky me, I found this out when the bus hit one of these mega-potholes and blew a tire! We had to wait for 30 minutes on the steeply inclined road halfway up the mountain while a rescue bus was sent to retrieve all the passengers and bring them the rest of the way up the mountain. To their credit, the bus company handled the situation very well, but it was still a bit frightening. The buses give you 90 minutes from when they drop you off, and although it feels a bit rushed at first, the timing is actually about right. 30-40 minutes is plenty of time to walk around the crater, take pictures, and absorb the scenery. It might be nice to have a little longer, and it might have been possible to miss my bus and take a later one, but I didn't want to risk it. From the point where the bus left us, it was still another 30-minute hike in slippery volcanic sand at roughly a 15% incline. The sand and dust is particularly brutal, and it's a tiring trek. On one side is the mountain, and on the other is a relatively steep drop. It's a good thing they had a sturdy rope handrail to ensure nobody fell, because as we all know, rope is extremely difficult to pass under or over. Once I reached the top, I walked about 3/4ths of the way around the entire crater. It's impossible to do the crater justice in photos, but suffice to say it was absolutely amazing. There were even a few active vents which were giving off steam. The view of the crater is amazing, but the view of the Bay of Naples and the surrounding cities is also fantastic, especially on a clear day. Yes, a selfie. How creative. The crater! For scale, those are people on the left. The hike back down from the crater was much easier, although because of the volcanic sand, it was still rough. I picked up a small rock of pumice laying along the trail as a souvenir (which I later wrote a college essay about! ), and met the bus for the journey back down the mountain. I made it back down to Pompeii Scavi around 3pm, and although I was tired, I wanted to visit Herculaneum. As I learned from Pompeii the day before, the best time to visit was in the afternoon when it was cooler and after many of the tour groups and day-trippers had left. After having lunch, I caught the next train from Pompeii to Herculaneum, taking care to actually count the stops this time. Of course, counting the stops wasn't actually necessary, since the train-car I was in had a working announcement system. Coming out of the Herculaneum train station, I walked down the hill on the main road, which dead-ends into the archaeological site. After buying tickets I descended into the city, and... Surprise, surprise, it was almost empty. There were about 10 other people in the entire city. Empty ancient cities are my favorite kind! Herculaneum is much smaller than Pompeii, and I managed to explore almost the entire city in about 2 1/2 hours before being kicked out at 7:30pm. It is actually better preserved than Pompeii, and many of the two-story buildings remain intact. Yet again, all the best finds from the city have been moved to the archaeological museum in Naples, but there are still plenty of hidden gems scattered throughout the city. I really enjoyed visiting both cities, but preferred Herculaneum since it was better preserved (and less crowded!). By the end of my second day, I was exhausted, but it was totally worth it. It's a lot to do in one day, but very manageable as long as you get an early-ish start to visiting Vesuvius. I had dinner at a small local restaurant and went back to my room, packed up my things, and crashed. Not even another eruption of Vesuvius could have woken me up. After breakfast, I checked out of the hotel and caught the next train back to Naples. I left my bags at the train station in Naples (Left Luggage at train stations is a wonderful thing! ), bought a metro ticket, and headed on the M1 to the Museo stop which is connected to the museum. The museum houses an unrivaled collection of artifacts from Pompeii, Herculaneum, and the entire surrounding area. I recommend doing the museum last because the museum is even more interesting having just visited the ancient cities where many of the items on exhibit came from. I won't bother giving too much more detail here, although the museum does have a special room dedicated to all the Roman artifacts that excavators were too embarrassed to exhibit elsewhere. This room has several paintings from the brothel house in Pompeii, a statue of Pan and the goat, and countless phallic Roman relics. It's quite an entertaining exhibit which is worth the price of admission alone. I spent the whole day at the museum, leaving around 6pm to catch my train back to Milan for my flight home the next morning. While I visited a lot of cool places during my trip last summer, Pompeii and the surrounding area stood out as the most memorable and the most interesting, and if you'll be in Italy any time soon, I'd highly recommend taking 3 days to visit -- It's an experience unlike any other.